4. 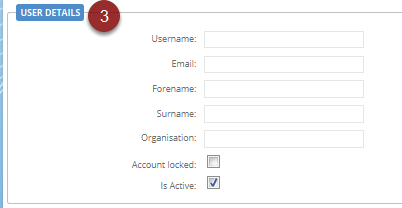 Under 'Account Details' you are able to set the home page for the user, that they will log in to, you are also able to set the product skin & layout if this is for an integrated version of Communigator. 5. Select the Roles you would like the user to have from the drop down menu, click 'Add Role' for each selected item. Any user that is setup with restricted tabs requires 'BaseLogin' to be selected! 6. Set the password for the user. 7. The user is able to reset their password at any time.